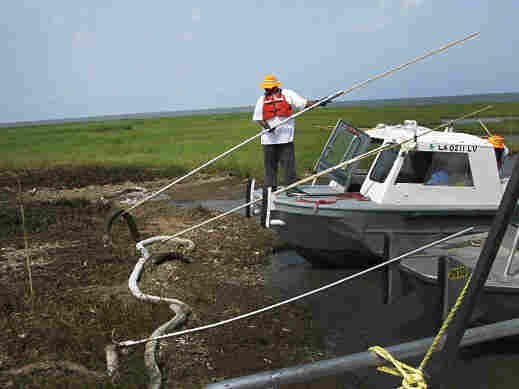 Marsh Cleanup Bid May Hurt More Than Help The furious effort to cleanse Gulf Coast marshes of oil leaking from the BP well blowout has some crews using techniques that might do permanent damage to the fragile wetlands, according to an NOAA contractor who is a veteran of 30 oil spills. Oil from the BP well blow-out has hit hundreds of miles of Louisiana's fragile marshes -- and many scientists worry that cleaning wetlands can do more harm than good. Some cleanup crews thought they had come up with a new, gentler technique to save oily marshes, but experts say their good intentions went awry. Near Cocodrie, La., seven small boats were clustered recently on the edge of a marsh. Most of them are usually used for crabbing. But on this day, the fishermen -- along with college students and construction workers -- were trying to sop up oil with large, makeshift mops. Locals say this marsh used to be covered with bright green, waist-high oyster grass. Now it looks ghastly. What little grass is left is smashed down and coated with thick, dark oil. Much of the area is stripped of all vegetation. It's just bare soil or shells drenched in oil. The workers know they're not supposed to get on the marsh. So they stand on the bows of their boats holding long poles with hooks on the end. They reach out as far as they can to drag what are essentially big sponges across naked roots. Manuel Magana usually drives a freight van in Houston, but he heard BP was hiring laborers, so he signed up. His boat hook must be 20 feet long. The makeshift sponge is light, but manipulating the long pole is really difficult. "It's worse when you've got to push it inside the grass," Magana says. "It can get stuck on you. You've got to really push on it. It can get heavy after a while." The sponges are basically mesh socks stuffed with polyester material that repels water but absorbs oil. They look like big white sausages. Some men have tied two ends together to make rings out of them the size of tires. As the men push and pull their sponges, the sponges get darker and heavier with oil. But after 25 men worked for four days on this small patch of land, there's still a lot of oil left. Gordon Bourque is the crew's safety supervisor. "They see how nasty it is; it makes them lean forward and press on no matter how hot it is," Bourque says. Is this little piece of marsh worth that kind of work? "Yes, ma'am," Bourque says. "It's our wetlands. If it dies, another little piece of Louisiana goes away. They're here to save it." But actually, they could be hurting it even more than the oil did. "That's definitely not a technique that we have ever recommended," says Jacqueline Michel, who heads up the teams surveying and cleaning marshes in Louisiana. A contractor for NOAA, Michel is a veteran of 30 oil spills. "We told everybody to stay out of the marsh. You crush the vegetation doing that." After I show her a video of the cleanup I saw, Michel says the workers -- not the oil -- smashed those plants. She says rolling those makeshift sponges over the grasses hurts them. Now the oil can enter into their roots and kill them. Michel says it's possible that some of the plants could recover. If they don't, this stretch of Louisiana could turn into open water and add to the rapid loss of wetlands here that makes it so hard to protect against hurricanes. "The people who are doing cleanup are not experts," Michel says. "Usually we have a little bit better control. We have Coast Guard and state monitors who can go out with the field teams and keep an eye on them." Michel says the right way to save wetlands is to vacuum up oil before it gets into the plants or gently flush the fringes of a marsh with water. Once oil gets deep into a wetland, you have to rely on the sun to degrade the oil -- and the tides and rain to wash it out. She says this oil spill is huge, so it's impossible to oversee each cleanup crew. Other teams have also harmed marshes by walking in them or wiping oil-stained grasses. Ken Sutcliff, BP's contractor managing the Cocodrie cleanup, defends his workers' effort. He says they came up with a good method that didn't do any more damage than the oil did. "That's just them being resourceful because they're not allowed in the grass, even though they're required to try to clean the oil up," Sutcliff says. He says he can't think of a better way to soak up the oil from the marshes, and he hasn't been given any order to stop the crews from cleaning that way. Ultimately, whether the oil or the cleanup kills the marshes, BP will be responsible for replacing them with healthy wetlands.